It is still common for many LGBT people from small towns and remote communities to face resistance and intolerance. These places are slow to adapt and change and often have close-minded attitudes about anything outside the norm. It’s usually an unwelcoming, and occasionally unsafe, environment to be openly gay so plans are often made by teens to move to some place more accepting as soon as possible. So goes the story of Miles Walton, a young gay man stuck in a dead-end town, desperate to get to Chicago in search of a better life. Nathan Aldoff’s latest film Miles taps into an experience that many outsiders searching for larger things in life can identify with and teaches the lesson to stand firm when you think what you’re doing is right. Miles Walton (Tim Boardman), a gay high school senior miserably stuck in his small home town, yearns to go to film school in Chicago. His dream is to get out of this oppressive community and go find his life in the big city where he can be free and open. When Miles’ father Ron (Stephen Root) dies unexpectedly, he and his mother Pam (Molly Shannon) discover that Ron has blown all of the family’s savings on a Corvette for his mistress. The money that was to be for Miles’ college tuition is now gone. Miles fears he will be stuck in this town just like everyone else who grows up there. He begins a search for scholarships and alternative schools with his guidance councillor and comes across one for students that play volleyball. Seeing this as his way out, he tries out for the girl’s team, the only one the school has. The coach agrees to let him play. Miles’ decision to play for the girls’ team causes a lot of commotion amongst members of the community and teams from other schools. A petition to forfeit games if he plays begins circulating. The outrage raises enough commotion to get the attention of the superintendant who calls a hearing for the case. It is decided that Miles will no longer play and if he attempts to do so he will be suspended. He is devastated that the college recruiter he convinced to come won’t see him play and he becomes frantic that he will be stuck forever. It’s at this critical moment that Miles must learn to take charge of his life and do what’s best for him, not what others want him to do and to not be beholden to your circumstances. He must find the courage to be himself and chase the life he wants. In her second entry at this year’s festival, Molly Shannon continues her career trajectory of choosing dramatic roles in smaller films, lending her name to help get the film made and to support new talent. While not her strongest work, she is still a loving and compassionate mother to scared and confused Miles. She would be wise to continue this path as it will surely lead to exciting performances. Young newcomer Tim Boardman also shows great promise, displaying emotional maturity and depth surrounding the deeper meanings of what his character arc is. The film has strong themes of demonstrating the courage it takes to change the world around you for the better, standing up for what is right in the face of opposition, and fighting for your dreams despite the obstacles put in front of you. While it’s easy to pick up on these messages, the film suffers from a weak script and at times, weak directing. The film could have had a stronger impact had the emotional payoffs of the story been laid out differently. It felt like a missed opportunity to not show if the community was changed by Miles’ actions and to not show Miles meeting the man in Chicago that helped push him into doing the right thing. The material also wasn’t quite strong enough to support the calibre of acting the supporting cast is capable of. With practice, writer/director Nathan Aldoff will continue to improve his storytelling abilities. Weaving the themes into the story in a more subtle way, improving his screenplay writing, and eliciting stronger performances from his actors will enhance the quality of his films. 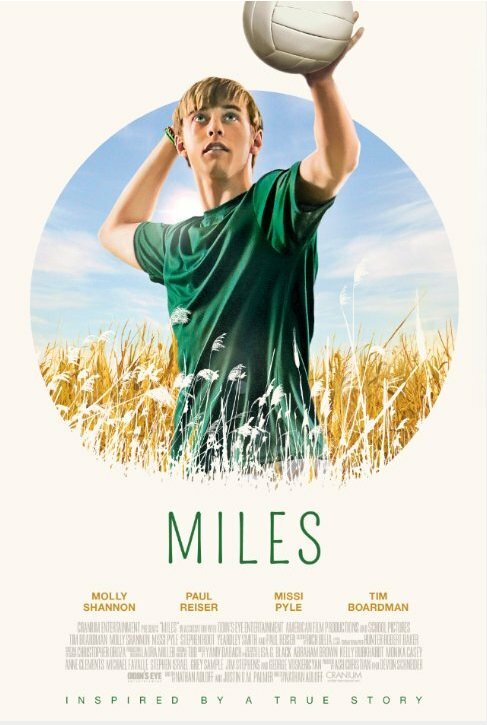 Despite its flaws however, the lessons learned from Miles are loud and clear. These messages are incredibly important to people who are part of the LGBT community. When they face the same pressures, they can learn to find the inner strength they need to conquer them and be their best selves.